They are a commission for twin boys born recently at only 30 weeks gestation. PS: Next post will be my 100th. You know what that means!!! And those quilt tops look fab! 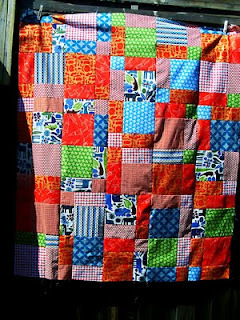 Gorgeous quilts Andi... beautiful and bright... There is nothing better than a tiny miracle wrapped in something handmade. Makes them look LOVED to pieces... Love how the quilts are different colours yet matching! Perfect! She's just the cutest! Lovely twin quilts but different enough for each twin to claim their own, lovely. You little girls looks beautiful. The quilt tops are great - lovely fabrics and colours. 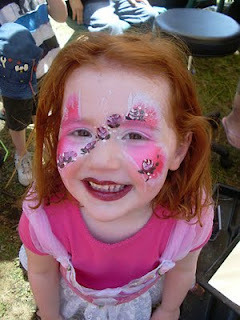 What a little darling she is - obviously pleased as punch over the pretty glitter and face paint! wow, you have been so busy making the most beautiful quilts! These for the mini-miracle-twins are so wonderful! They are both unique but they go so well together! 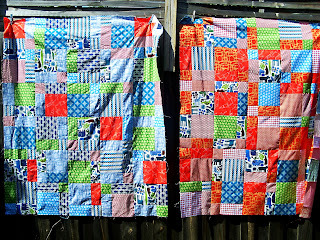 I love those 2 quilts - I bet they'll dwarf the tiny twins! Born after 30 wks? My niece was 5 weeks early and sooooo tiny, I can't imagine how teensy those 2 must be. Don't you just LOVE her!!! 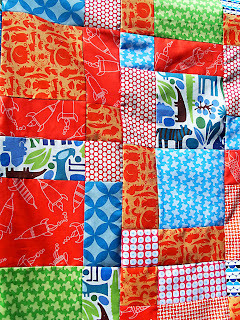 What beautiful colourful quilts for the tiny twins. OH!!!! your 100th Post, would you be having a giveaway??? Well done Andi, great quilts! That Ella, always makes me smile - gorgeous! Your girl looks so cute! The quilts are awesome - colourful, happy! What lovely quilt tops. The recipients are indeed very special if they were born at 30 weeks. They must be wee little tots. I love your sweet little pink and sparkly butterfly too! gorgeous!!!! oh little twinnies born so early....am going to say a little prayer that they are doing well and grow up to be big and healthy and don't they have gorgeous quilts too! love the little miss too! How excellent. I'd be feeling pretty glowy on the inside knowing my bits of quilty loveliness were destined to snuggle a couple of little miracles!